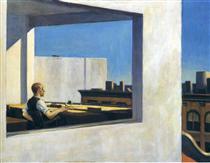 No other artist managed to capture the solitude within the modern city like Edward Hopper. The ‘artist of empty spaces’ offers a remindful look at life of Americans during Great Depression. His suggestive imagery shares the mood of individual’s isolation with books of Tennessee Williams, Theodore Dreiser, Robert Frost, Jerome Salinger, as well as with canvasses of Giorgio De Chirico and Paul Delvaux. 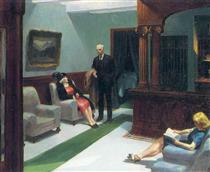 Hopper depicted the spirit of the time very subtly, showing it in the poses of characters, in the vast empty spaces around them, and also in his unique color palette. 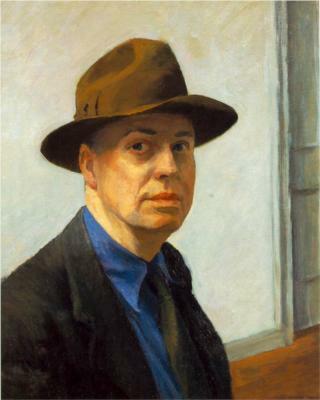 Edward Hopper was born into a middle class family in Nyack, NY, a vibrant hub of transport and industry at the time. The boy was already serious about his artistic ambitions in the age of 10, when he started to sign and date his drawings. Hopper's parents encouraged him to study commercial illustration instead of fine art. Accordingly, he spent a year at the New York School of Illustration before transferring to the more serious New York School of Art (now Parsons School of Design) to realize his dream. His teachers there included the American Impressionist William Merritt Chase (who founded the school) and Robert Henri, a leading figure of the Ashcan school, whose proponents advocated depicting the grittier side of urban life. Hopper's classmates at the school included George Bellows and Rockwell Kent. 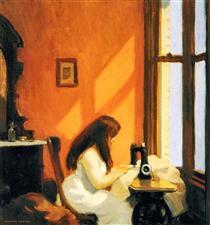 In 1905, Hopper began working as an illustrator for a New York City advertising agency. He never really liked illustrating and longed for the freedom to paint from his imagination. Unfortunately, success was slow in coming and he was forced to earn his living as an illustrator for nearly 20 more years until his painting career took off. Hopper travelled to Europe three times between 1906 and 1910, enjoying two extended stays in Paris. There he created beautiful uninhabited landscapes, deprived of tourist sights and attractions, including Steps in Paris (1906), Bistro (1909), Stairway at 48 rue de Lille Paris (1906), The new bridge (1909). The influence of the Impressionists led him to the streets to draw and paint en plein air, or, as Hopper described it, ‘from the fact.’ He was especially attracted to Édouard Manet and Edgar Degas's unusual compositional arrangements in their depictions of modern urban life. After returning from his final trip abroad in 1910, Hopper moved permanently to New York City and, in 1913, settled in a house that would be his home and studio for the rest of his life. That same year he sold his first painting, Sailing (1911), for $250 at the Armory show in New York. Though he never stopped painting, it would be 11 years before he sold another artwork. In 1915, he took up printmaking, producing some 70 etchings and dry points over the next decade. Like the paintings for which he would later become renowned, Hopper's etchings embody a sense alienation and melancholy. One of his better known etchings, Night Shadows (1921) features the birds'-eye viewpoint, the dramatic use of light and shadow, and the air of mystery which would serve as inspiration for many film noir movies of the 1940s. Hopper continued to receive great acclaim for his etchings over the years and considered them an essential part of his artistic development. In 1924, at age of 41, Hopper married Josephine (Jo) Nivison, whom he had met years earlier as an art student of Robert Henri. From that time on she became his primary model and most ardent supporter. 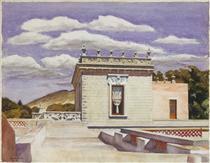 In that same year he had a solo exhibition of watercolors at the Frank K. M. Rehn Gallery in New York. The show sold out and the Rehn Gallery continued to represent him for the rest of his life. This success enabled Hopper to finally give up illustrating. Over the next several years, Hopper's painting style matured and his signature iconography emerged - from isolated figures in public or private interiors, to sun-soaked architecture, silent streets, and coastal scenes with lighthouses. In 1930, House by the Railroad (1925) became the first painting accessioned to the permanent collection of the newly founded Museum of Modern Art. 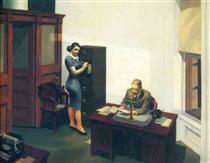 The early 1930s were, indeed, a period of great success for Hopper, with sales to major museums and in 1933, a retrospective at the Museum of Modern Art. Despite his commercial success, Hopper and Jo lived a frugal lifestyle, only allowing themselves the indulgence of attending theater and films. 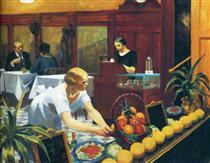 Hopper particularly loved going to movies - his first documented visit to one was in Paris in 1909. Hopper continued to be productive during the war years – at that time he worked on his most well known painting, Nighthawks (1942). Through the 1950s and early 1960s, Hopper continued to see acclaim and success, despite the arrival of Abstract Expressionism, Pop Art, and Minimalism to the New York art scene. The universal appeal of his subjects continued to find an avid audience. 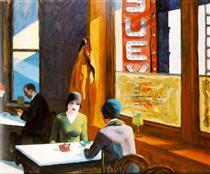 Hopper was not a prolific painter. He often found it hard to settle on a subject to paint and then spent a great deal of time working out the details of the composition through numerous studies. By the end of his life he averaged just two oils a year. Hopper has inspired countless painters, photographers, filmmakers, set designers, dancers, writers, and musicians and the term 'hopperesque' is now widely used to connote images reminiscent of Hopper's moods and subjects. In the visual arts, Hopper's influence has touched artists in a range of media including Mark Rothko, George Segal, Banksy, Ed Ruscha, and Tony Oursler. He also inspired a whole school of photographers including Robert Adams, Diane Arbus, Harry Callahan, William Eggleston, Walker Evans, Robert Frank, Lee Friedlander, and Stephen Shore. Hopper has had no less of an impact on cinema. Generations of filmmakers have drawn inspiration from Hopper's dramatic viewpoints, lighting, and overall moods, among them, Sam Mendes, David Lynch, Robert Siodmak, Orson Welles, Wim Wenders, and Billy Wilder. His painting, House by the Railroad (1925) inspired Alfred Hitchcock's house in Psycho (1960) as well as that in Terrence Malick's Days of Heaven (1978). Hopper's open-ended narratives have also appealed to writers and musicians. Tom Waits titled an album Nighthawks at the Diner and Madonna named a concert tour after the painting Girlie Show (1941). 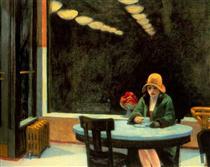 Joyce Carol Oates refers directly to Hopper in her poem, Edward Hopper's Nighthawks 1942. Many others have created whole collections of stories or poems using Hopper paintings as starting points.